we react to words in different ways. for instance, “interesting” to some people could mean what it was originally meant to be. “interesting” to my mom implies unusual, and not in a complementary way. in some of my friendships, i filter myself and how i phrase my words more. i can be a blunt, possibly even verbally aggressive, person, and there are some people who can’t handle that. that’s fine. we’ll just talk about classes and whatnot. and then there are the people who can handle my heat, and i’ll rant to them about whatever or tell them about insignificant little things in my day. probably in caps, perhaps with some autocorrect mistakes (“delirious” turned into “delicious” the other day. that was not my point, especially since my sentence in relation to finals studying, “we’re all delirious,” became, “we’re all delicious.” ack), sometimes with a vastly different language. that’s why i’m not fazed by some things that, for lack of a better phrase, would cause others to be like, “AW HELL NO.” (somehow my family picked up on this phrase and i’m not sure how/why this came to be). i first had honey toast at shokudo in hawaii. i wasn’t convinced at first- the name is unassuming, and i could slather honey on a piece of toast at home for much cheaper than $9. BUT. this isn’t merely a slice of toast. it’s a box made of toast, filled with toast. warm, crispy, honey-scented, buttery toast that slackens ever so slightly as the ice cream melts. i’ve decorated the honey toast here with fruit and chocolate and cookies, but as long as you have the honey toast and ice cream, you’re set. Think of the honeyed buttery toast that you love for breakfast, reimagined into dessert and topped with ice cream, cookies and fruit! Cut the bread in half crosswise. Cut out a square: make 2 incisions vertically on top and another 2 incisions horizontally. Make sure to leave an inch from the edges and bottom of the bread. For the first brick, make an incision on one side, 1 inch from the bottom, leaving 1 inch from the corners as well. For the other brick, just cut out a square leaving 1 inch from the edges. Now set aside the 2 bricks. Cut the insides into small cubes. Combine the butter, sugar and vanilla until homogeneous. Spread on the insides of the bricks, and all the little cubes. Bake at 350F for about 8 minutes, or until golden brown. You can do this in your toaster oven if it's big enough (or a conventional oven if using a toaster oven isn't an option). Fill the 5-sided brick with cubed bread and fruit. Drizzle honey on top. Place the hollow brick over the first brick, twisting slightly. Add more cubed bread, fruit and cookies (cookies optional). Place the ice cream on top, and finish with more drizzled honey. 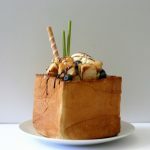 I decorated this honey toast with blueberries, cigar cookies and matcha Pocky, but feel free to use whatever you'd like! The presentation looks so pretty! Sounds interesting and yummy! I ate honey toast in SIngapore and thailand and had no idea what to make of it at the time! Thanks for this recipe : ) This looks straight out of the cafes I went to! Delicious! oh this definitely isn’t a dessert for one situation (; and if you add more fruit than sweets, it’s healthy, right?! This honey toast looks super-impressive, Heather! 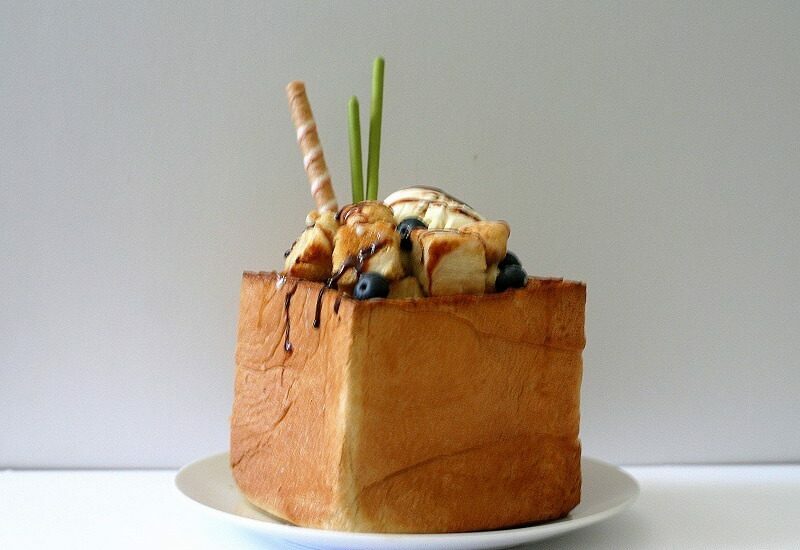 I’ve never had “honey toast” but I do love this presentation, it’s like a gift! I love anything with honey, and still have a bit from last summer’s Farmers’ Market – this would be a perfect use for it! toast me up (; but yeah as soon as i thought of that line, i felt like i hit the toast jackpot. This is so true. When my father is proud of me he says Outstanding… Mary that’s outstanding, it sounds so formal but it fills my heart with so much joy. I am a very verbally aggressive person so happy to know I’m not alone. OMG did you say a box made of toast?? filled with toast!!!! I can’t wrap my head around it, but my mouth is watering. This is so fun! Love the way it’s set up and I do love honey! delirious just looking at it (; thanks christina!! Never heard of this dish but it sounds DREAMY! Would need to find a dairy free alternative to the butter which I’m sure can be done. This is so beautiful! I’ve never even heard of this but it looks yummy! What an impressive looking dessert! Plus it’s easy to make and I love how you can fill the toast box with whatever sweets you want. Wow, now this is a show stopper! it is! the first time i had it, i couldn’t stop staring (and i didn’t know where to start without toppling it! you just need to go for it though). haha and this isn’t even the most intense honey toast out there (; there’s ones that tower and have a lot more toppings than this! Such a pretty little dessert! So elegant!! I love how easy it is to prepare – great photos Heather! I always thought of “interesting” as something good and unique. Oh man, the people that can handle a lot of heat are troopers! Haha, I know I am quite a talker myself. I agree with you that we are shaped by the experiences we face. One thing’s for sure, I was surrounded by negative people that brought me down a bit @__@ But not anymore! Haha. 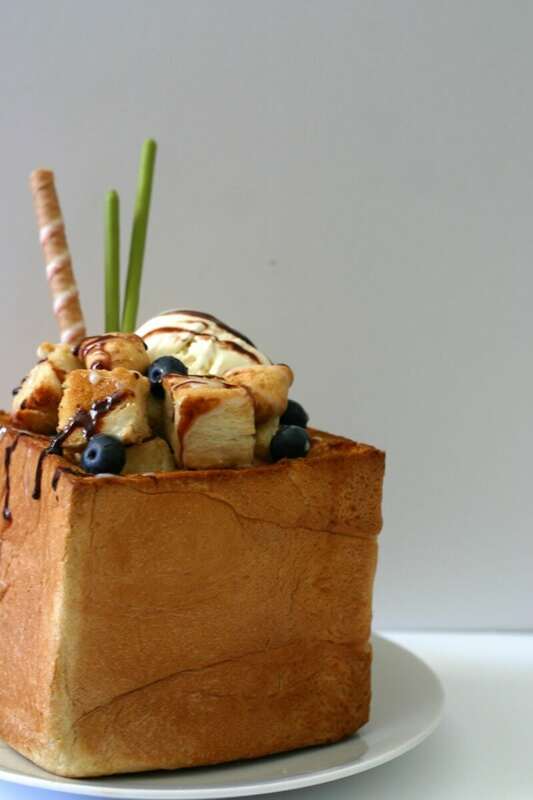 The honey toast looks so cool! I had it once somewhere in San Gabriel and it is so expensive! It is definitely cheaper to make at home! I love how you made it look so nice! yeah it’s always $8-12ish at cafes and dessert places! and for toast with toppings, that’s not quite worth (even if it is tasty!). Real cake it is ! Thank you ! Holy Heather haha! You just made the dessert of my dreams. I seen these at HK cafes but I was never hungry enough to try this but damn! I think I need to – best part is in the comfort of my pjs! pwahahaha! haha if you don’t want to go out for it i guess you’ll have to make it at home (; it’s best served when you have a few people to help devour it (it is kind of a behemoth! ).